The LA Galaxy triumphed in a battle of two teams riding three-match winning streaks, with a pair of first-half goals from Zlatan Ibrahimovic all they would need to beat an overmatched Philadelphia Union side, 2-0. Jim Curtin opted for a more defensive look coming into the match, handing loanee Jamiro Monteiro his first MLS start in the midfield. To accommodate the Cape Verdean, Brenden Aaronson slid up to the 10, Marco Fabian started as a second striker next to Cory Burke, and Fafa Picault and David Accam headed to the bench. The match started slowly, with the Galaxy having most of the ball. Fabian’s outing as a second striker ended prematurely, as he picked up what appeared to be an ankle knock and had to be replaced by Fafa Picault in the 23rd minute. Los Angeles took the lead in the 27th minute through their Swedish superstar. The Union couldn’t break up the Galaxy’s strong buildup in the attacking half, and the home side worked the ball to fullback Jorgen Skjelvik on the side of the box. Skjelvik put in a strong cross that crossed the face of goal and found Zlatan Ibrahimovic at the edge of the six-yard box. 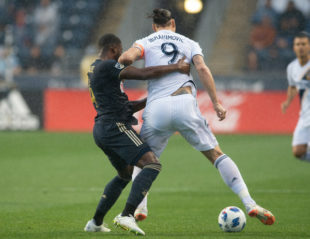 Ibra rose up over Auston Trusty and powered a header right inside the post, where Andre Blake had no chance for a save. Zlatan got his double just nine minutes later. On a similar cross in from Skjelvik, Ibra came together with Trusty and Kai Wagner at the penalty spot. The three went down in a tumble of bodies, and the referee pointed to the spot. Replay showed that Wagner undercut Ibrahimovic, although it also appeared that Zlatan may have fouled Trusty simultaneously. The call stood after a peek at VAR, and Zlatan blasted home the penalty to make it 2-0. The Union, overrun for most of the first half, had a few good moments after going down by two. Monteiro and Haris Medunjanin stung David Bingham’s palms on strikes from outside the box, and Picault whiffed on an inch-perfect cross by Alejandro Bedoya. LA also put the ball in the net a third time after a gorgeous move, but Ibrahimovic fouled Gaddis right as Joe Corona put the ball in the net. After seven minutes of first-half stoppage time, the Union entered the locker room down two goals. Philadelphia got off to a brighter start in the second half, and came inches away from halving the deficit in the 55th minute. A floated cross by Kai Wagner found Bedoya, whose shot twas saved off the line. The rebound fell to Cory Burke, who also missed, and the second rebound again found Bedoya. His tantalizing attempt found woodwork, which denied the Union’s captain a game-altering goal. The Union created precious few chances beyond that, and their fate was effectively sealed when Auston Trusty got his marching orders in the 76th minute. A foul on Roman Alessandrini earned Trusty his second yellow of the second half, leaving the Union down to ten men. Trusty left the pitch for the Union for the first time since the 2017 season; his streak of 41 consecutive starts will end next week. The match fizzled out, and Philadelphia’s three-match winning streak came to an end. The Union return home for their next match, an Eastern Conference clash with Montreal Impact. Kickoff at Talen Energy Stadium on Saturday, April 20 is at 1:00 p.m.
Zlatan. Two goals and two assists in two matches against Philadelphia for the Galaxy’s superstar. There’s no one quite like him in the league, and the Union’s defenders couldn’t keep him off the score sheet. Outplayed. Yes, the second penalty kick call was weak. But the Union never really looked like scoring, so that’s no excuse. The midfield, in particular, looked discombobulated, and Cory Burke and Fafa Picault still can’t find their shooting boots. The scoreline was fair. Trusty, Fabian leave early. It’s too early to know whether the Mexican DP will miss more time, but his early departure forced the Union to change their plan early on. Meanwhile, the red card to Trusty means Mark McKenzie will get his first start of 2019 next weekend. Fun fact: McKenzie and Jack Elliott had never played together in MLS before tonight. Why did Accam not play at all? Just curious, he would’ve definitely been my pick over Picault. Picault tracks back on defense better so made sense to come in as the first half sub for Fabian. My guess is that Curtin was planning to bring in Accam but then had to change plans once Trusty got the second yellow (even trying to come back, playing two in the back would have been suicide against LA). That makes sense, but I feel as though accam especially needs to keep his confidence up by playing regardless, since he had such a bad year and he’s only just starting to play now. That being said, I appreciate Curtin changing some things up and trying to see what works. First off he is an amazing player of size and skill that few teams can control and the MLS has never seen. Secondly he is probably one of the biggest dirt bags in soccer. He scored his first goal by launching himself over Trusty and shoving him down from behind to score his first goal. I am sure that if Burke had done the same thing at the opposite end the goal would have been disallowed and Burke would have been carded. The ref mostly turned a blind eye when it came to Zlatans shenanigans in the box. The second goal that came from the penalty was a result of a jump ball that ended up in tangled bodies and Zlatan being awarded a penalty kick. The Zlatan effect had Curtin playing scared and going away from his diamond formation and not using Acsam .Nobody looked comfortable playing the Zlatan formation. . The mids looked completely clueless as to how to generate an attack . I guess Maybe he was playing for a zero zero tie? As a result of Curtins “Zlatan formation” Aaronson truly looked like an 18 year old . Marco was ineffective as a forward and Monterio who I had high hopes for looked lost. Fafa continues to missfire and I am also confused why Accam did not play at all. If it wasnt for Bedoyas grit and Harris’s game sense the game could have easily gotten out of hand and ended at 4-0. I put this loss mostly on the “Zlatan Effect”. Tough to win when Zlatan’s getting the Michael Jordan calls, but the Union were outplayed for all but about 30 minutes of the second half so probably didn’t deserve to come out with anything. Obviously the big worry going forward is Fabian’s ankle. Probably good that Trusty is getting some time off as the rest might leave him stronger come the end of the season. First loss with Aaronson seeing the field. Union had one nice moments last night and might have made an argument that they deserved more. Gotta learn to finish chances, though. All in all, a loss on the road to LA is not the end of the world. What stings is that MLS officials had an outsized hand in the result. Zlatan is apparently allowed to use opposing players as step ladders when he attempts to put a header on target. And wha was the ref looking at for 5 minutes on the. VAR monitor? PRO refs really need some training. Can someone explain why you would go more defensively just because you’re playing away? While I don’t disagree with the zlatan effect, I also don’t understand why we wouldn’t put the lineup that had cohesion in for any away game. I get roster rotation and also getting jamiro game time due to recent quality outings but if we were going to go defensive, you want your forwards providing pressure, something Fabian doesn’t do well. I also don’t think rotation was needed so early in the season. I would’ve much rather seen accam get a go considering his form of late. Also, I get the sense that bedoya isn’t going to enjoy being out at right back regularly. He seemed annoyed when gaddis was subbed out, but my stream could’ve just been shotty. It’s always a tough thing to fly across the country and get a result in this league and both teams were playing well – on 3 game winning streaks – going into the game. Plus losing a player early with an injury never helps the plan. It wasn’t a great performance but it also wasn’t a complete disaster. Zlatan sought out Trusty. Elliott and Medunjanin did good job containing him so he smartly drifted toward Trusty. Wagner didn’t have a good night. Haris clearance late second half was best defensive play of game aside from a spiffy grab by Blake in traffic. Ilsinho had good breakaway and flying up center left with fafa to his left, and 3 defenders caught flush right and I thought here comes our first goal. But then the Brazilian not only ignores Fafa but goes RIGHT! Straight toward 3 defenders, trying his footwork, and lost the plot. He is impressive but Never have I seen him take the path of least resistance and I think that costs us as many points as he has given us. Otherwise not disappointed as result expected. We should win next two. Expected loss, call it a wash. Ready for Montreal. everyone keeps mentioning the zlatan effect and i just want to also take some time to complain about it. in no way did philly deserve to win this game but its the most irritating thing in sports that stars get the calls all the time. this is just me shouting into the wind, but how is this the accepted norm? why give some of the best players even more of an advantage by having the referee constantly give them favorable calls? its really frustrating and disheartening to watch and it happens in every sport. Thank you for providing so much insight into what could have been done better rather than just throwing out general criticism. Your sole insight that I saw was to whine about Ibra and the refs. That being said, no real need exists to overanalyze a road game that was expected loss. My takeaway is that Trusty in order to get a night off committed some unnecessary fouls, much like medujanin getting the red last year in the infamous double-red card game last year. Fatigue and frustration. With the depth albeit a 26 man roster, I am surprised there isn’t more rotation of defense. McKenzie shouldn’t be getting minutes simply when someone is hurt or expelled from the game. I think Vancouver game gives chance to give guys including Blake a well-deserved rest and others precious minutes. Rough outing by a few players, but clearly Zlatan was the difference in the game, justifiably or not. The Fwd corps, minus Accam honestly, has been disappointing thus far. Maybe it’s time to give Kaspar a try with Accam? The midfield continues to play very solidly. Wash LA travel game, jsut need to move on quickly.